I just went through the same thing to get rings for my 2.4. It took two parts stores and three tries to get the correct ones. Did you see the video that pic came from? My brother Duncan will be doing the towing duties for the Rampage RT, he was thinking maybe coming out Tuesday? He has a new long range Prarie dog gun that he would like to try out, you mentioned in a post your active in that. There's nowhere around here for it so he was hoping you guys could set something up in the afternoon/evening? Can you call or txt him to coordinate the transfer, his cell is 714)400-8752. Also, I tried to txt you a message about it but your phone doesn't recieve texts? My first turbo Mopar was an '88 Dodge Daytona turbo that I bought in '95 with the insurance money I got from totaling my '91 N/A Shadow. 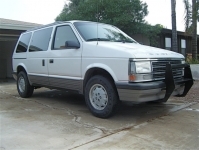 I currenty drive an '88 Dodge Caravan that I bought for $50 that came with a 3.0. I installed a 2.2 turbo engine because that's what I had. After driving this for three years I finally have a 2.5 in it that I built. I've done many modifications to my van. Do a search to check some of them out.